sunshine blog » Is it worth it to go to a travel show? As folks begin to plan out their year ahead, I’ve been asked by some if it’s worth going to travel shows. By “travel show,” I mean the exhibition-style events open to the public where destinations, travel agents and tour operators show off their wares. Some of these events are business-to-business only, but there are plenty of public events too, such as TNT Travel Show or the Adventure Travel Show. I’ve been to several, so here’s my take on the usefulness for the average traveller. Getting ideas for holidays you’d never thought of. 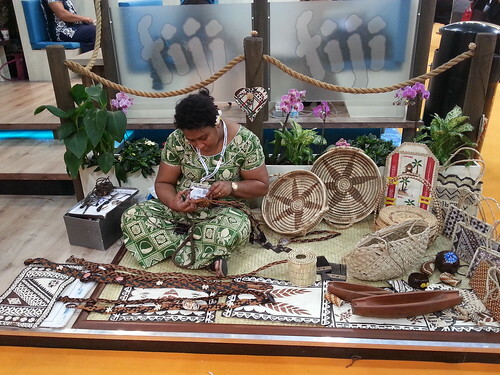 Many destinations put together lavish presentations, such as this exhibit of hand-crafted works from Fiji shown above. These countries are putting their best foot forward, but often it’s enough to tempt you into putting a far away place on your radar. Plus, this is a fun chance to talk to people who are actually from those places. Great perspective. Meet popular travel authors and publishers. Whether its Rick Steves you’re after or your favourite Lonely Planet author, most of these exhibits have small travel workshops with talks given by well known travel writers. It’s a great opportunity to hear writers talk – but many of the bigger names will have full rooms. Take a look at any public talk schedules in advance and get to the room early for your must-see talks. Free samples. There’s usually interesting food and drink floating around these events. Go on, try it! Lastly, these shows are also good for overwhelm. You’ll find lots of destinations, lots of options for all budgets, and lots and lots of walking, so be sure to pace yourself! Actually booking the trip. Most of the people at those booths are sales and marketing folks, not actually people who can take your order. So, if you find something you like, get specific details on how to get your trip booked, especially if they’re offering discounts or extras that aren’t normally available. See above advice. Finding really specific stuff. If you know you want to go on holiday to South Africa and you want to find budget all inclusive resorts, you’re looking for too specific – Google is better at that. These big shows are more like broad brush-strokes, so take a step back. The way I look at it, a travel show is great for helping you choose why and where, then go back home for the what and how. Are you a fan of travel shows? Any favourites? Tell us in the comments below.